I'd love to hear more about that discussion on how gnomes became a PC race for D&D. It's an unfortunate fact that inconclusive researches are harder to sum up that successful ones, but here goes a sort of brief interim report. (1) for most of the twentieth century 'gnome' seems to have been a generic word very like 'goblin' or 'imp' or 'fairy' or 'elf'. When one did appear, it was generally in a comic context. (3) there's a long tradition of 'gnome' as a name for humanoid earth elementals, but D&D obviously didn't choose to go that route. Though interestingly enough it has both salamanders (as a non-humanoid fire-creature) and fire elementals, the former poss. inspired by the rampaging salamander in Poul Anderson's OPERATION CHAOS, which I'm currently reading. But the gnome/earth elemental just isn't there in the race's core concept. The xorn or even the umber hulk wd have been closer. (4) my interim conclusion: gnome was added to the PLAYER'S HANDBOOK player-character races as a token non-Tolkien character. Then anytime someone made the case to Gygax that an awful lot of his game --the player-character races, a third or so of the core monsters, the very concept of a multi-racial multi-class player-character party -- were all borrowed directly from Tolkien, whose works Gygax eventually came to disparage, he cd point to the gnome as non-Tolkienian. And ask Tolkien Enterprises to please not sue him. In short: I put it on par with 'mithral'. They're not fooling anybody. (5) my guess: if there is any direct ancestor for the D&D gnome, it's likeliest to be found in UNKNOWN and its descendents/derivatives. So here's a question I'd like to know the answer to: where does the first gnome NPC appear -- what adventure? And when does the first gnome pre-generated PC see print? current reading: OPERATION CHAOS by Poul Anderson. *even using Tolkien's preferred elves over the then-standard elfs and Tolkien's own invention dwarves over the pre-Tolkien universal usage dwarfs. Not to mention Hobbits > Halflings. ***I told them it'd sell a bunch more copies if they called it THE COMPLETE BOOK OF HALFLINGS AND GNOMES. I still think I was right, too. Just three cats this morning: AVERY and MINERVA (Harvey) and TABITHA. They pretty much got along (not without some hissing when they felt it called for), even when two cats wound up in the same cage from time to time. All had used their litter boxes, but none was interested in a spoonful of wet. One did lick a little of the sauce off, but that was it. To my surprise, Minerva came right out. I’d brought in a box for cats to jump in and a little bag of catnip to sniff, which she discovered while I was still cleaning and seemed to thoroughly approve of. Also to my surprise she scratched at the door wanting to go for a walk. And once out she did a lot of walking, down past the fish tanks and right up to the front door. When picked up and carried away to a different spot, she worked her way around to the door from a different direction, and then did it yet again. She clearly has her mental map of the store and knows where she wants to go (out). It was a long walk and she did really well on it. Avery was a little shy about walking until I took her over to the training room, where she prowled about with great satisfaction, purring when I talked to her (she likes the sound of her name). She behaved very differently when in the inner or outer room (friendly, relaxed) vs. when in her cage (tended to swat at hand reaching towards her). I stayed an extra half-hour because she had a visitor who came down from Lynnwood to spend some time with her. Tabitha doesn’t like walks. She’ll let herself be carried all around, but after a while the mewing starts and it’s time to come back in. 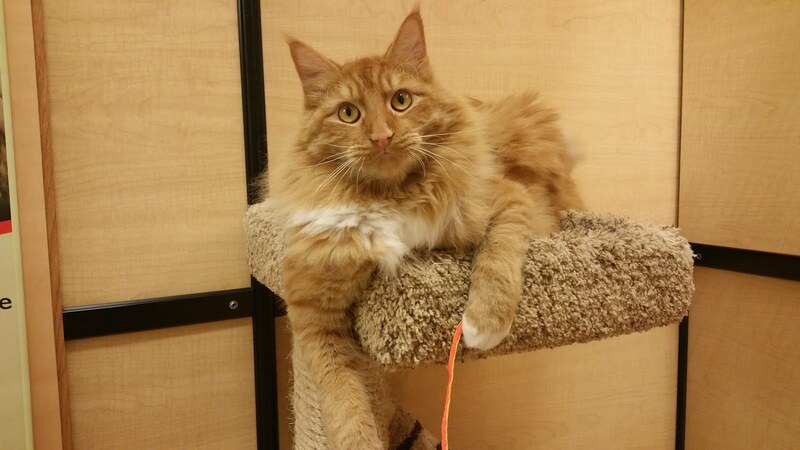 She likes to do her exploring in the cat-room, and loves pouncing games. A guy met her during her walk who had a lot of questions about her and took her picture before he left. Think he’s interested but is about to go on a trip to Hawaii; we might see him again when he’s back if Tabitha is still with us then. On the whole, a fairly quiet morning in the cat room. health concerns: Avery got in various dirt boxes several times and dug around but only did any business once or twice. Minerva/Harvey does have a little trouble jumping up and seems to favor her back legs. But she had no problem walking. Moving her to the bottom row was a good idea. Back on my normal (11-to-1) routine today, last week having been the last for me taking the (9-to-11) morning cleaning shift, and so had lots of time to socialize the cats. When I got there Emma and Lisa already had them out and well taken care of, so I plunged right in with TABITHA. She did the same anxious mew mew mew as last week for about half of the walking time, then she got distracted and interested, and forgot to mew while she did some exploring. I took her down to the training room at the far end of the store and she relaxed in there, treating it kind of like a big, big cage. AVERY was reluctant to let me put the leash on; once out I took her straight to the training room, where she relaxed and did a lot of prancing about, rubbing legs, and asking to be petted. When it was time to leave the room she navigated her way back to the cat room without any trouble, so looks like her mental map now includes pretty much the whole store. As for CHESTER, what a beautiful, friendly, charismatic cat. Quite the charmer. Hard to believe someone would give him up for adoption; don’t think it’ll be long before he’s in a new home. He’s clearly been out on a leash before and did really well. He’s the kind of cat who walks up to people and asks for attention, which they were happy to give him. Oddly enough, when towards the end of my shift I decided to give him a second short walk, he kicked up a terrible fuss at the idea of having the leash on again so I gave up the idea. Avery went into her cage after her walk and pretty much stayed there, hissing and swatting at my occasional offers to pet her — she’s clearly adjusting to her plans to become boss-cat of the room having collapsed with the arrival of Chester. Think she’ll settle down over the next few days. Tabitha (‘Queen of all String Games’) demanded games, and Chester wanted to join in. She’s perfectly okay with getting close to him, but he’s wary of letting her close and sometimes hisses her back. I brought in a paper bag, which they all ignored. By contrast, the cat-nip spray was a big hit (except with Avery, who thought it might be a spray-the-cat water-bottle). Both Tabitha and Chester loved the string game and the mouse-on-a-stick game (I left that behind as a gift). In addition, Chester showed great enthusiasm for the feather-duster. In short, both cats got to exercise their inner predator without anyone getting hurt. Speaking of which, I feel bad for Minerva. AND the person she bit. Twice! She had been so much better last week getting out and about on the leash that I hoped she was opening up. It’s hard to be a senior cat in a cage. Hope she does better at the next cat-room. And while it’s too bad not to get to meet Kit/Luna — never seen whiskers that long on a cat before — I’m glad she got re-united with her owner so quickly. Can we have the whole story on that someday? 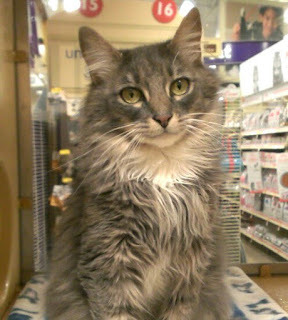 no health issues, but happy to report a donation from a PetsMart customer; I pinned this to the calendar. And that’s it for another week. I just have to add that upon returning home I found our cat FEANOR thinking he was due a walk himself, so I obliged. He doesn't go far these days, just around the back porch and into the side yard, but he enjoys smelling outdoors things, watching birds or bunnies, and eating some grass. It was his day for seeing other animals up close -- first our next-door neighbor's dog Sidney (whom he knows pretty well, they having stared at each other a lot from our respective balconies) and then The Grey Cat, a neighborhood cat who seems fascinated with Feanor and comes up and watches him sometimes when he's out. This time he got to within about a cat's length of him whereupon Feanor mewed a time or two. Then they went their separate ways. Hastur, meanwhile, was upstairs on the desk in a box; she only ever wants to go out when it's getting dark (which is a bad time for me). So, Thursday Janice and I headed up to Seattle to see a play at the Taproot Theater. It's been so long since we've been there that the theater we'd gone to last time (where we saw SEVEN KEYS TO BALDPATE) has since burned down and they've shifted to a new location (v. nice). This time we had come to see BUSMAN'S HONEYMOON, having heard it recommended by friend Jeff (http://grubbstreet.blogspot.com/2017/06/serious-wimsey.html). We enjoyed the play -- they didn't quite nail it, but it was good fun nonetheless. But my scholar's soul can't let pass one error in the program book. and J. R. R. Tolkien. Clearly she ran with very smart people"
--the last bit ('very smart people') is true enough, but the part about being an Inkling isn't. In the words of C. S. Lewis, cofounder (w. Tolkien) of the group, "She never met our own club [The Inklings] . . . and probably never knew of its existence" (THE INKLINGS, p. 189). All in all, though, an enjoyable evening. I'd gladly go there again. And it got Janice and myself thinking back over the Petherbridge adaptations in the 80s -- is it really that many years ago? -- and the Carmichael ones a decade or so before that. Seeing how many classic mysteries and series have been remade in recent years, I'm surprised these haven't been redone. One can hope . . .
current reading: THREE HEARTS & THREE LIONS (just finished) by Poul Anderson. #II.3380. ANATHEMATA (read aloud) by David Jones. So, the most recent volume of THE JOURNAL OF INKLINGS STUDIES has arrived, and as always there's at least one piece to which my eye is immediately drawn -- in this case, Don King's piece on a previously unknown (to me, at least) little work by Warnie Lewis, longtime Inkling and C. S. Lewis's older brother: MENS HUMANA (or 'Kilns Table Talk'). It's long been known that Warnie, who lived with his brother and CSL's common law wife, Janie Moore, despised the latter. It's also well-known that Warnie and CSL kept a collection of things their father said* that made him look stupid** -- a prime example being their claim that he believed the ancient Babylonians were Japanese, due to his inability to understand the difference between the words "Sumerian" and "Samurai". Now, in addition to the 100 sayings that make Albert Lewis look bad, we have seventy-two that make Mrs. Moore look bad. Except we don't: in this case we don't get the whole of MENS HUMANA but excerpts, most of them summarized rather than quoted directly. Oddly enough, editor King pretty much accepts Warnie's point of view as his own-- that Moore was a horrible woman: conceited, mean-spirited, snobbish, self-righteous, and petty, as well as "dogmatic, contentious, and irascible". He also conflates the Janie Moore who was suffering from dementia (probably Alzheimer's) in the final four years of her life with the person CSL fell in love with; much of CSL's comments when she was in her final decline sound v. familiar to anyone who's been a caregiver. All in all, a curious and disturbing piece. **which he wasn't: not only did he have two brilliant sons but seems to have been a voracious reader and was well-known as a sharp-witted Belfast lawyer. These'll take some getting used to. current reading: THE GHOST IN THE CORNER (the new book from Lord Dunsany). Great news that Mr. BOSCO found a new home. He was a charismatic fellow and I have no doubt he’s already won the hearts of his new people. That left us with four cats in the cat-room: AVERY, MINERVA, TONKS, and TABITHA. Everyone came out right away except Minerva, who enjoyed games (laser pointer) and petting in her cage. She’ll let you know if she wants you to stop, with a slap if needed to drive home the message. At one point we had quite a ruckus when Tonks jumped into Minerva’s cage, who proceeded to give her the what-for. There was much hissing and much swatting but after Tonks had gotten back out of there she didn’t have a scratch on her — it was intense but unarmed, so to speak. Minerva is the only one who didn’t get a walk -- even though I got her out enjoying herself on one of the cat-stands at one point, she was back in the cage when walk-time came around and I thought digging her out of the cage a second time wd just rile her up and start off the walk on a sour note. I’ll have to remember to start with her next time. Avery was moody, although I think glad to be back in the big cage now that Bosco's adoption had freed that up again. She spent most of the morning in the outer room, keeping an eye on the other cats and occasionally joining in a game. She had a good walk over in the training room, purring all the time. Her fur’s finally grown out, just a beautiful as expected. Think maybe she needs more one-on-one attention. Tabitha was charming. She came out right away and curled up on the bench, purring whenever anyone gave her some attention. I can finally tell her from Minerva! (Minerva has an all-black nose). She enjoyed games, but she’s a lazy predator and wants to swat at things that come in range, not to have to chase after it or leave her comfy spot. She had a short walk, mostly a carry, which I cut short after she started mewing. She was happiest when someone sat beside her. Tonks was adorable. 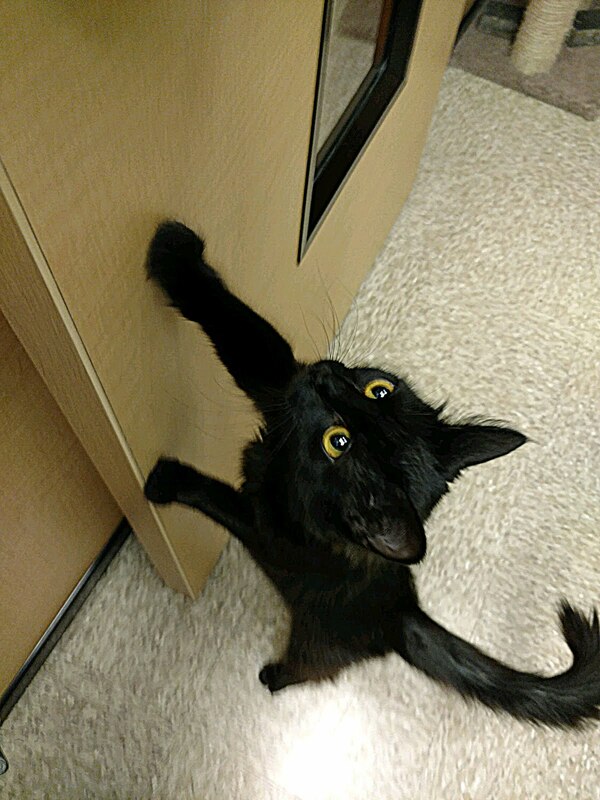 Into everything: wanting to climb in every cabinet, play with every toy, ride on your shoulder, and see if whatever you’re doing is a good game. She had a good walk, especially when she discovered the end-cap with catnip toys: she thought it was a great idea to have them all at her level where she cd sniff each in turn. She wanted to play with everybody, but nobody wanted to play with her except me. What a great little cat. In the still-new-at-the-Cleaner-thing department: I forgot to check off the boxes on the clipboard. Sorry about that. health concerns: none, but I did notice that (1) none of the cats ate their wet catfood and (2) they all love to sneak into each other’s cages and use other cats’ sandboxes. So, Tolkien's GNOMISH LEXICON is well-known,* and the Sindarin deriving from it is one of the world's most famous invented languages. Recently I became aware that there was a second gnomish language, this one poorly attested (in fact, we only know two words from it). I am speaking of course of the once-popular book GNOMES by Wil Huygen (text) and Rien Poortvliet (art), which had a vogue in the late '70s (and was much imitated) but is now I think pretty much forgotten. I recently tracked down a copy and reread it for the first time in many years, as part of a larger discussion (still ongoing) I've been having with some friends about the origins of gnomes as a player-character race in D&D. It does not stand up well, but I was bemused to find that it does give a little 'Gnomish' in passing. The first occasion is when we are told about mid-book (GNOMES having no pagination) that the Gnomes' word for 'goodnight' is slitzweitz. Among themselves gnomes speak their own language. place a word, they immediately ask its meaning. Their written language is the ancient runic script. --a slightly different gloss from goodnight but no doubt close enough. And that's it: I don't know if they made up more words in 'Gnomish' in the books that followed (only the first few of which I read, and that long ago -- definitely a case of diminished returns) but I thought it worth sharing that they at least made the effort. Though I suspect they were inspired more by Richard Adam's WATERSHIP DOWN than JRRT. **which I bought way back when working on the PULP CTHULHU project but have never read till now. So, I've been having another go at sorting out the few to keep from among the many to get rid of from among the boxes of gaming magazines. I used to be an avid reader of such magazines, back when there were such things as rpg magazines, before I distanced myself from the industry after I left Wizards for the third and final time. It's been interesting revisiting that lost time when rpg magazines stalked the earth, reading reviews of then-new releases, some of which are now revered as classics, others long since forgotten. Looking back over the array of rpg journals -- some of which had long runs, others here and gone -- it amazes me just how many journals there were. Each major (and many minor) rpg companies had their own magazine. DRAGON MAGAZINE was always the dominant one: it had an extraordinarily long run and for much of its run was by far the best journal out there, the standard against which all the others were (and shd be) judged. Have to give a special shout-out to a few though, any of which wd be worth revisiting in a post all its own: ARCANE (one of the finest rpg journals ever to see print), INTERACTIVE FANTASY (smart, thoughtful, always looking for boundaries to push, albeit a bit too self-important, prizing innovation above everything else), and THE GAMER (in which editor Scott Haring managed to produce the closest thing to a truly independent rpg magazine -- a feat all the more impressive considering some of the fractious talent he had as regular contributors). And of course there are a few I simply have a personal fondness for, such as ADVENTURE GAMING (which successfully continued the DRAGON MAGAZINE experience for a time and, more importantly, provided a home for FINIEOUS FINGERS). And then there's GYGAX, the recent attempt to see if the old-school' revival cd carry over enough to support an old-style gaming magazine as well (the answer turns out to be no, not so much). That said, if anyone out there wd like the first four issues of CASUS BELLI or an assortment of five random issues of SORCERER'S APPRENTICE, let me know and I'd be glad to see them off to a good home). current reading: the two adventures in the new 7th ed. C.o.C. core rulebook. *of which I have a large, but unfortunately not-quite-complete, run. **I played an inadvertent role in its demise, but that's a story for another time. So, it's taken me a while, but here are some more of those D&D variant rules being used in early 1980 in Fayetteville, Arkansas: the first version of the D&D rules I learned. I shd stress that these are for the most part typed, with the exceptions hand-copied. * Nothing was typeset or xeroxed** from a book or even a magazine. Str to Wis 3:1 "
IQ to Wis 2:1 "
Next up comes the Characteristic Table, listing all the pluses and minuses you get based on what race your character turned out to be, with the ability scores listed along the top and the character race along the left margin. The ten characteristics given are Str, IQ, Wis, Dr, Dex, Ag, Voi, Com, Sz, & Con. For example, a Hobbit (so named) gets no change to Str, IQ, or Wis; +6 Dr, +4 Dex and Ag, no change to Voi and Com, -12 to Sz, and +6 to Con. By contrast, a Stone Giant got +10 Str, -33 IQ, no change to Wis, Dr, Dex, or Ag, -5 to both Voi and Com, +55 to Sz, and +10 Con. Also on this page are possible bonuses and penalties for rolling really well or really poorly on characteristics. If you rolled 18, you could roll again. A 16 on this second roll gave you +1 to the characteristic [=19, I suppose]. A 17 gave you +2, and an 18 a +3 and the right to roll again (and so forth). Similarly, if you'd rolled a 3 when generating the character you had to roll again. A 5 on this second roll gave you a -1 to that characteristic [=2, I suppose]. A 4 gave you a -2, and a 3 a -3 and you had to roll again. I'm not sure how a characteristic score of 0 or below worked; hopefully not many had to face that dilemma. As you can see, this game really believed in random dice rolls. So, today was the first with me filling in for the 9 to 11 am cleaner/socializer shift rather than my usual 11 to 1 walk-the-cats shift. Thanks to Shane for coming in and showing me the ropes. I’d gotten the training for the cleaning/feeding routine back when I started at the Renton cat room (which is a bit different from the way we did things back in the old Tukwila cat-room), but that was more than a year ago now and I’d forgotten the details; good to have a refresher course. We’re now back up to five cats, so the room feels full again for the first time in a long time. In the big cage is BOSCO, a big (18 lb) cat who’s a love bug. He loves attention, being fed, being played with, and wouldn’t mind more food if someone else’s is left unguarded. He went out for a walk that was interesting. He got carried a lot and otherwise kept trying to hid under and behind things for the first half, up until he came face-to-face (mere inches away) with a large and fortunately friendly dog. After that he relaxed and explored. It was as if he decided nothing worse than seeing a dog could possibly be out there, and he’d come through that alright, so he might as well relax. Like so many tubby cats Bosco has difficulty grooming his bottom, so had to do a little intervention there, which he didn’t much appreciate. We’ll need to keep any eye on it, since cat-bottoms get red and tender when not kept clean. He’s definitely a stumpie not a rumpie — that is, I think his little fat stump of a tail is because he was born that way, not from any traumatic injury along the way. The second new cat is TONKS, a small black little cat with deep golden eyes. She wants to come out and meet everybody, play with everything, and generally show off her friendly, playful personality. She likes to ride on your shoulders. She too had a walk but was on edge the whole time (lots of time up on my shoulders where it was nice and safe). I’d be surprised if she doesn’t find a home quickly. She was pretty friendly with the other cats, with just the occasional hiss when she felt threatened. She was apparently a litter-mate of Lupin, who passed through our cat-room on his way to being adopted a few weeks back. The third new cat is tuxedo-cat TABATHA. Also pretty friendly, once her suspicions about the other cats had been overcome. She too had a walk, but it was a short one: she was sharply focused on trying to get back into the room, too nervouse to enjoy herself. Maybe when she settles into her new quarters and gets to know and trust us better. The other two cats are familiar faces back for a return engagement: MINERVA and AVRY. Avry loves being petted inside her nook but doesn’t yet feel safe enough to venture out into the room. I think once she gets used to being in previously familiar surroundings she’ll start to come out and accept her due attention. For her part, Minerva looks so much like Tabatha that I had trouble tellling them apart. She too was on the quiet side today — a bit shy while adjusting to being back, I think. She’d already gone back in her cage and was settled, so didn’t want to un-settle her with a walk. Definitely a good candidate for next time. — Someone had some sneezing after she came out and went into the front room, but I forget which cat it was — perhaps Shane remembers. — also, the fur around Bosco’s bottom will need checking on a regular basis and, when necessary, cleaning. A wet cloth works really well, but in a pinch wet paper towels wd probably do. current reading: MYSTERY AND MORE MYSTERIES by Robert Arthur (just finished). So, today I got a notice that the copy of BEREN & LUTHIEN that I ordered from England will be arriving here around June 16th. Fortunately, the Kindle version arrived at nine o'clock last night, so I'm already well into my first reading of these newly arranged and re-presented texts. The frontmatter by CT was deeply interesting; now I'm into the first version of the Tale itself. I'm enjoying it quite a lot; I'll say more when I have more to say. Meanwhile, it's back to working on Endnotes. Collingwood and Stukeley and Yeates, oh my.